All Go Forward and Back! What's it like for the people who live in small-town America at the beginning of the twenty-first century? 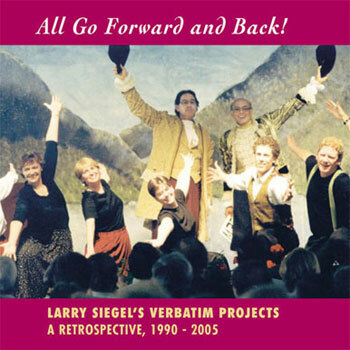 This recording is a collection of original songs created in residencies that composer Larry Siegel of Westmoreland, NH has had over the past decade and a half. The words were mostly created by participants in these Verbatim Projects - sometimes in groups, sometimes solo. The projects have generally been performed by community groups with or without any prior experience. For this retrospective recording, some of the best traditional players in the world have graciously come together to help showcase this work. You'll hear funny stories, sad stories, and visions of a life that might have been, and that might yet be, beautifully sung and played in a wide variety of styles. Verbatim Projects were created and performed by ordinary citizens playing together over the course of a weekend, a month, or a year. You could do this yourself! "It is often said that collaborations yield results which are greater than the sum of their parts. In the many collaborative projects of which I have been part, much of the magic has had something to do with this phenomenon. But at the same time - and never more than with this recording - I have been graced with some REALLY talented work partners."